traditionally, the authentic fried rice tastes more on spicier side with the strong influence of chilli sauce and soy sauce. but the corn fried rice recipe tastes comparatively sweet because of the sweet corn. i generally does not like sweet rice or sweetened flavoured rice, hence i serve this with moong dal or any dal recipe. 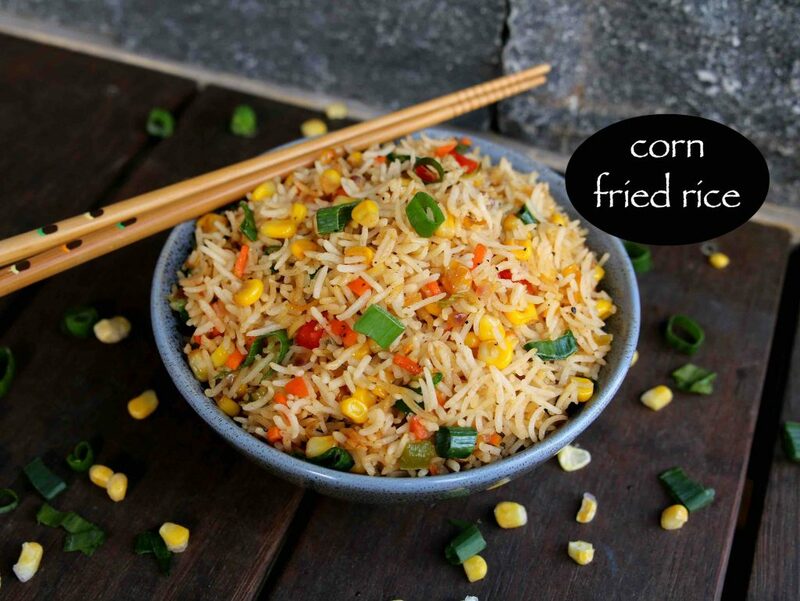 but traditionally sweet corn fried rice is served with spicy manchurian sauce like gobi manchurian gravy or chilli paneer gravy. in addition the meat lovers or eggetarian can add minced meat or egg whites to make it a perfect balanced meal. 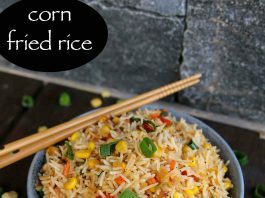 while there aren’t any complicated steps in this corn fried rice recipe, yet i would like to highlight few tips and recommendations. firstly, the fried rice recipe turns great with left over dry long grain cooked rice. 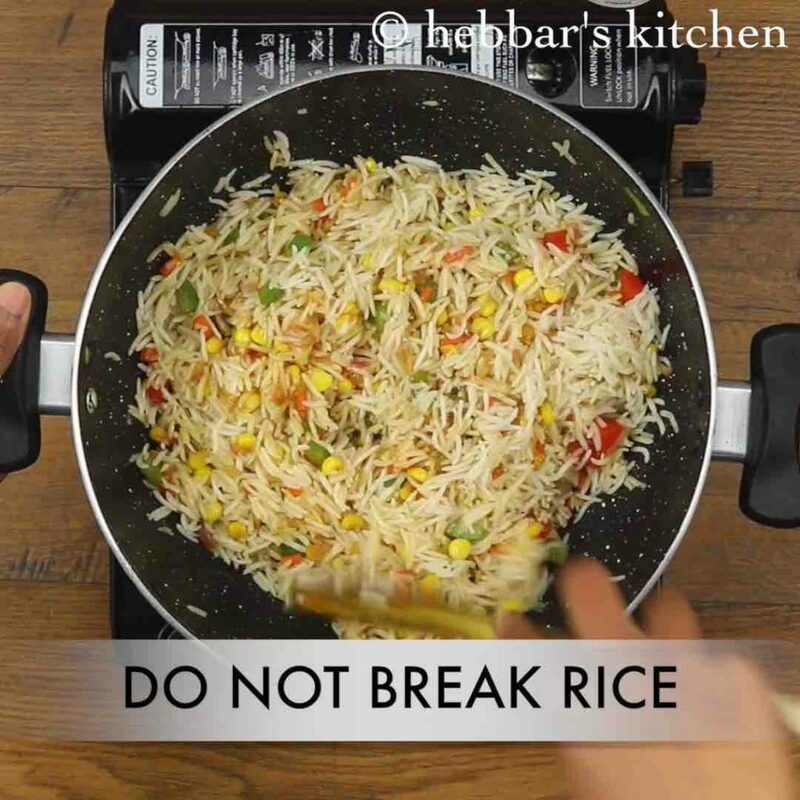 alternatively, you can use freshly cooked rice only after drying them until all moisture is dried. secondly, i have not added ajinomoto for this fried rice recipe, but you are more than welcome to add it. lastly, i would heavily recommend to cook fried rice in a high hot flame. cooking in high flame, fried vegetables and rice yet retaining the crunchiness. 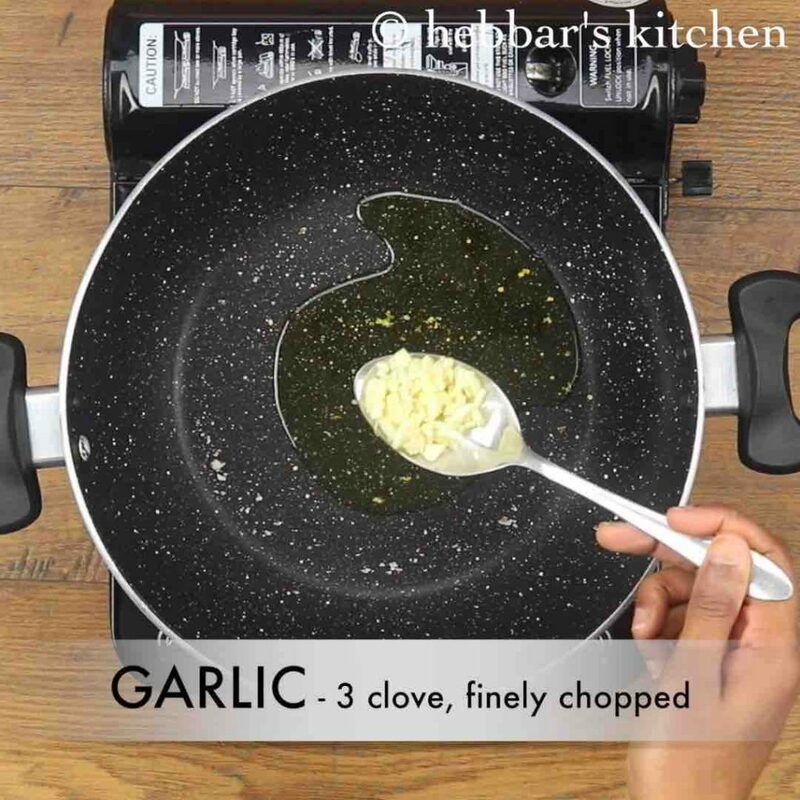 firstly, heat 2 tbsp oil and saute 3 clove garlic. 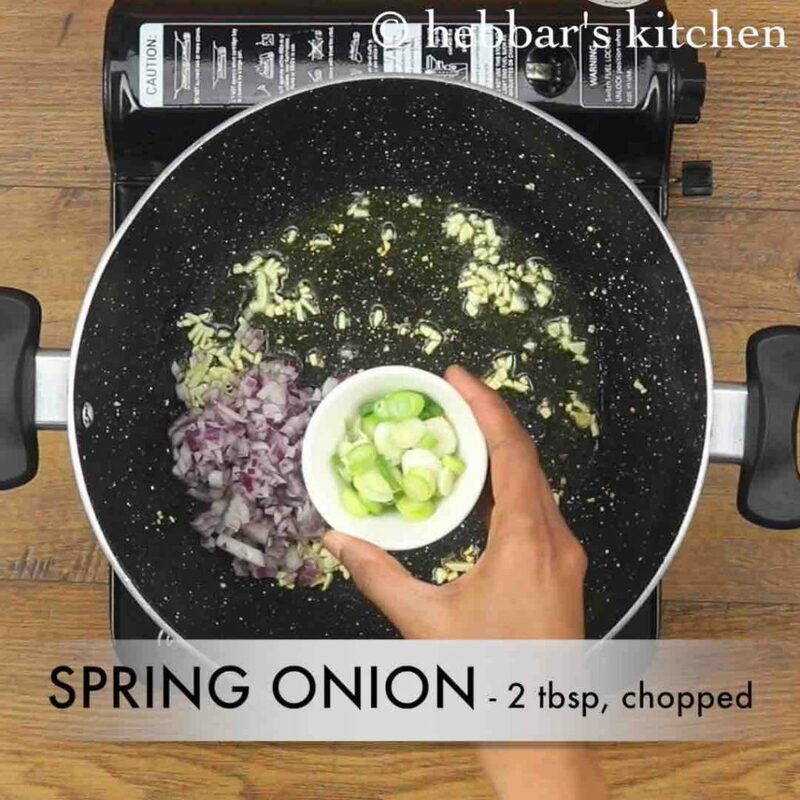 further saute ¼ onion and 2 tbsp spring onions. 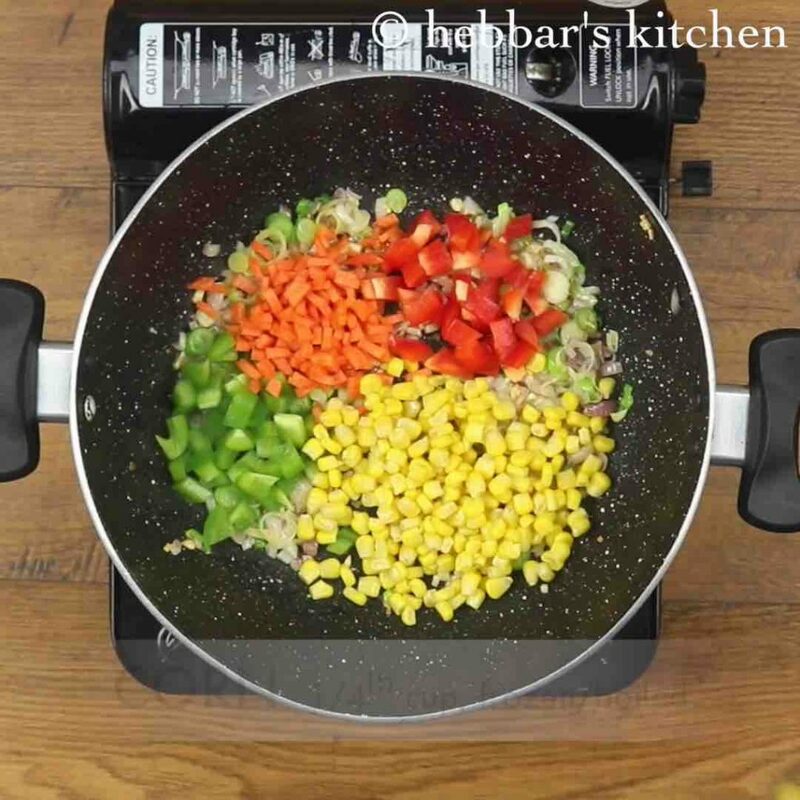 also saute 2 tbsp green capsicum, ½ carrot, 2 tbsp red capsicum and ¼ cup sweet corn on high flame. now add 2 tbsp vinegar, 2 tbsp soy sauce and 1 tsp chilli sauce. saute on high flame for 30 seconds. 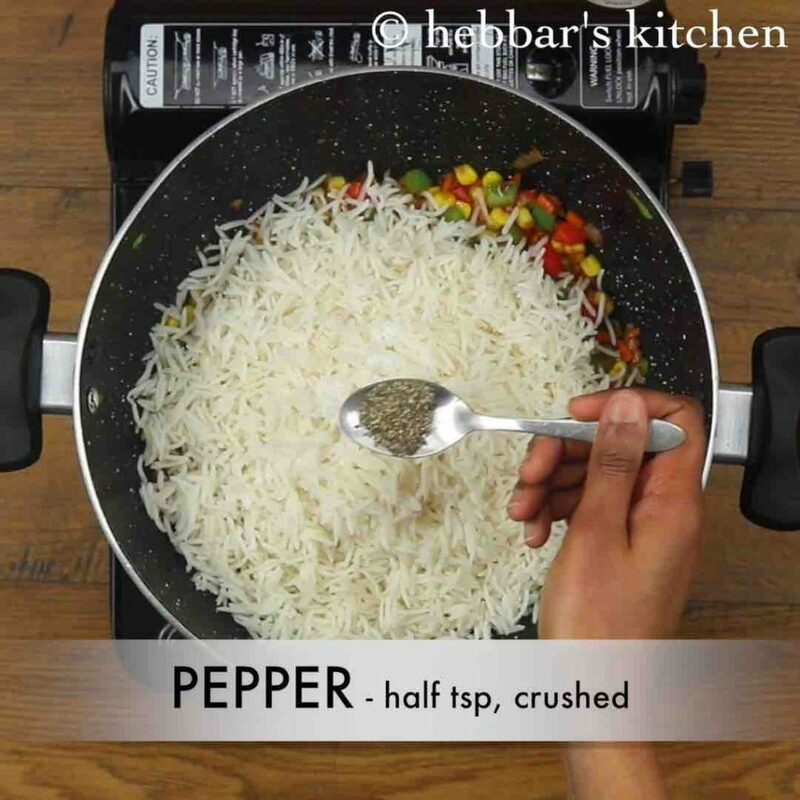 add in 2 cups of cooked basmati rice along with ½ tsp salt and ½ tsp crushed pepper. mix gently, without breaking rice grains. finally, serve corn fried rice with gobi manchurian gravy or enjoy as it is. 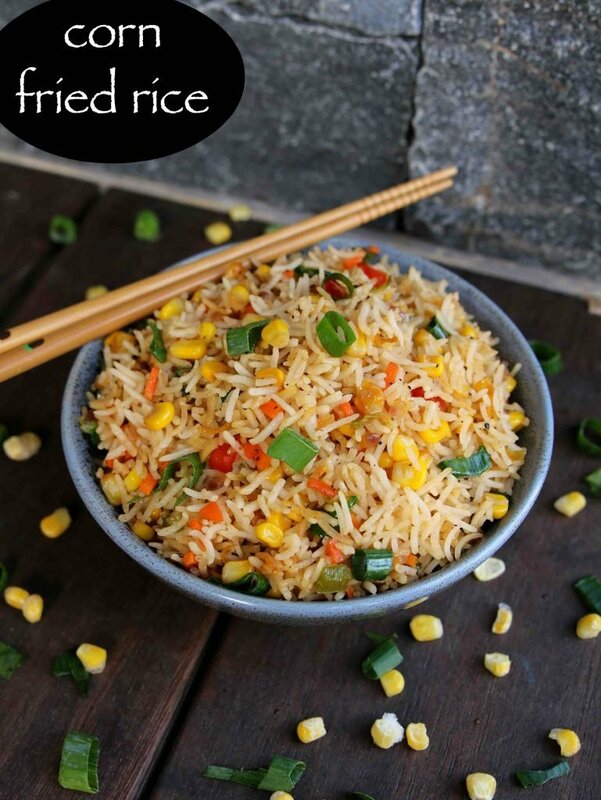 firstly, prepare fried rice on high flame to get street style indo chinese flavour. also if using fresh corn, then make sure to boil once. however, no need to boil if using frozen corn. additionally, add vegetables of your choice like snow peas, beans, broccoli to make fried rice more healthy. 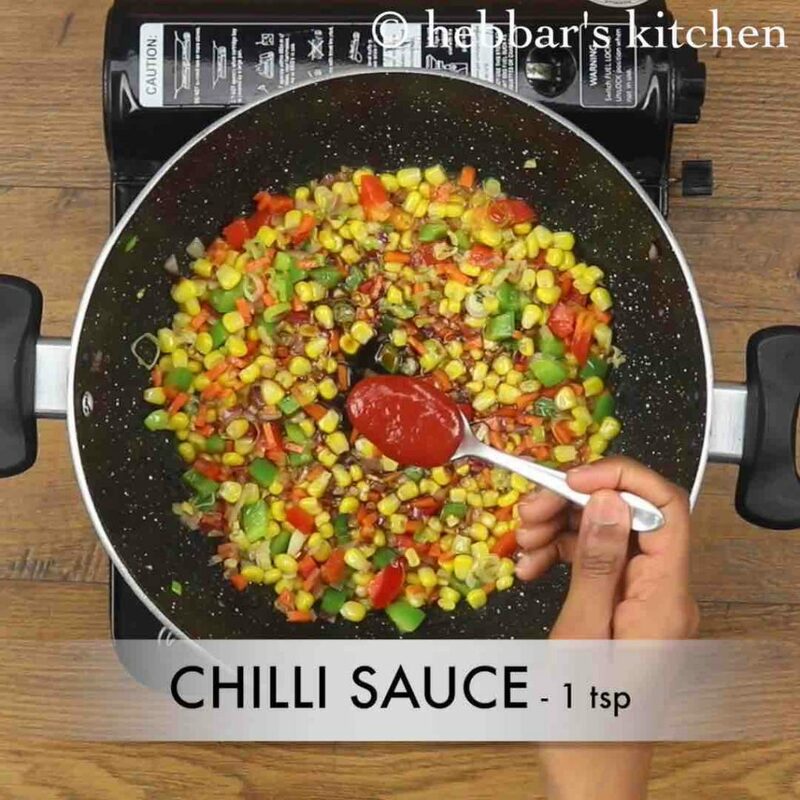 finally, corn fried rice turns to be slightly sweet, so adjust the chilli sauce to your taste.